Is it possible to have enough shoes? At the Bata Shoe Museum, the answer is an emphatic 'no.' 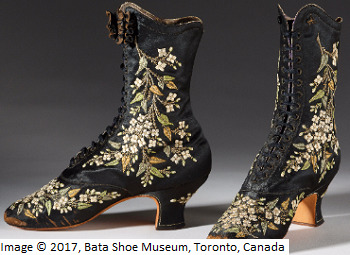 This unique museum, located in the heart of Toronto, is dedicated not only to the preservation of shoes from a diverse array of time periods and places but also to sharing the stories and wealth of knowledge available from these seemingly unassuming objects. "We all wear shoes," explains the BSM's Senior Curator, Elizabeth Semmelhack. "Despite the fact that we all have an intimate knowledge of this object, the real fact of the matter is that shoes can reveal larger cultural structures. They really are a fascinating way of stepping into larger cultural ideas." The Bata Shoe Museum evolved out of the remarkable personal collection of Swiss-born businesswoman Sonja Bata. Mrs. Bata moved to Toronto in 1946, where she became involved with the global shoe industry. During the following decades, she amassed an extraordinary collection of thousands of shoes from all corners of the world and all periods of history. 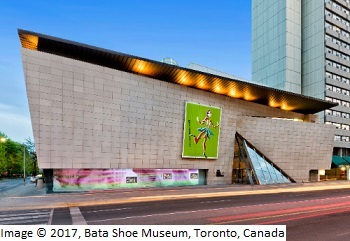 The Bata Shoe Museum Foundation was founded in 1979 when the collection finally outpaced available private storage, and the museum opened in 1995. Today, the BSM is the only shoe museum in North America, and it houses over 13,000 shoes and related artifacts that nearly span the entire scope of recorded history and nearly every culture in the world. "Our oldest artifacts is 4,500 years old and is from ancient Egypt, while the most recent objects are sneakers," Semmelhack explains. At the BSM, shoes are a vehicle for sharing insights into the powerful cultural structures that influence visitors' lives. "We think shoes are worn to protect the foot, but for the majority of shoes, that is not their principal function," explains Semmelhack. "Shoes are essential in establishing gender and social identity. If a man decides to wear a pair of red high heels, he is constructing an identity. Our footwear choices are not really as wide as one might think. Those are the sorts of questions that we grapple with."